A former showroom located in the Yonge and Eglinton area is to be developed into a mixed-use building consisting of lofts, condos and commercial retail. A portion of the site has been dedicated to the City to provide park space for surrounding residents. 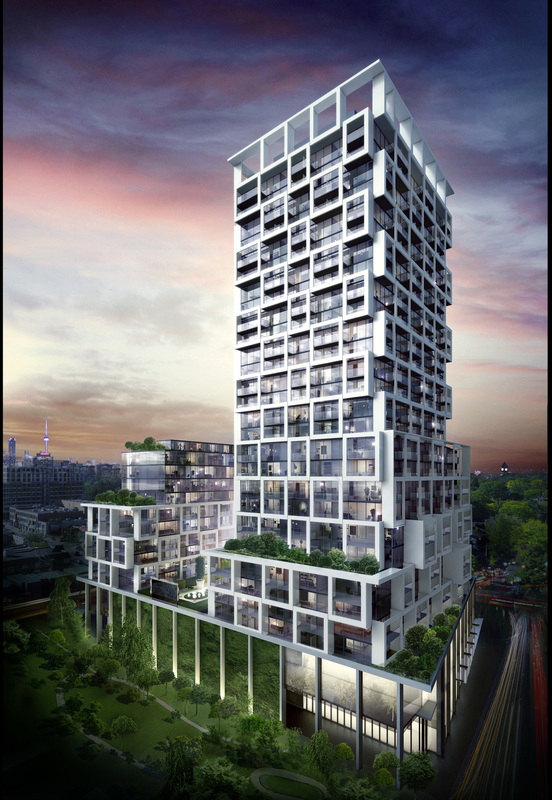 A respectable fashion designer, Karl Lagerfeld designed the two residential lobby spaces which was his first-ever major project in Canada. • Counterpoint is currently collaborating the building’s detailed engineering, stormwater management and road realignment. • Meeting City of Toronto water balance targets are always a challenge in urban redevelopments. Counterpoint is working with the project team to implement innovative stormwater management design measures. Through development meetings including all design disciplines, we will explore the possibilities to utilize any small spaces available throughout the building plans to store water for flood control and to harvest water for reuse in the rooftop green space irrigation system. The site has been designed and approved and the project is in final stages of construction.